I love Puerto Rico. When I’m watching the snow fall and bundling up because it’s 10 degrees in Colorado, I can’t help but want to escape to the beautiful 85-degree weather in Puerto Rico. 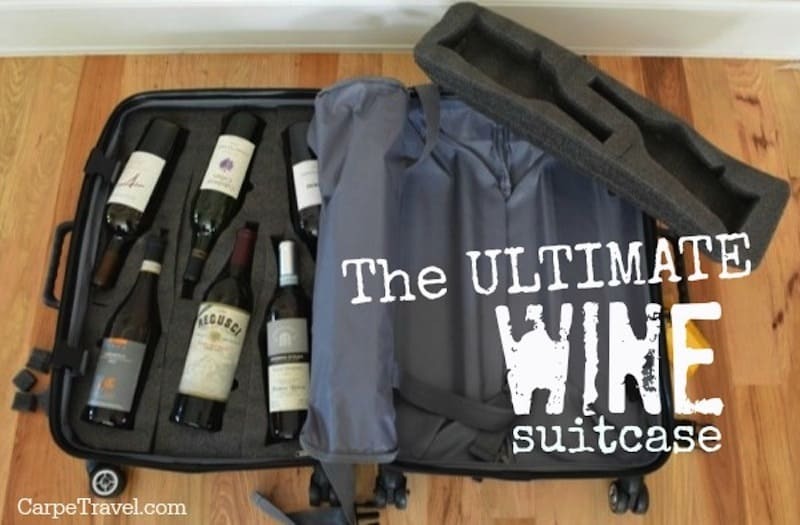 It’s one of my absolute favorite winter escapes. Puerto Rico has continually raked as one of the best place to visit in the Caribbean, as well as one of the top family winter destinations and for good reason – not just one reason but several! Ease and affordability of getting to the island. No passport requirements for US citizens; Puerto Rico is a U.S. territory. Both English and Spanish are spoken. The abundance of activities for all ages. 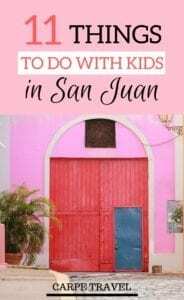 The city of San Juan and Puerto Rico as a whole have a lot to offer kids of all ages, even if those kids happen to be “adults”. 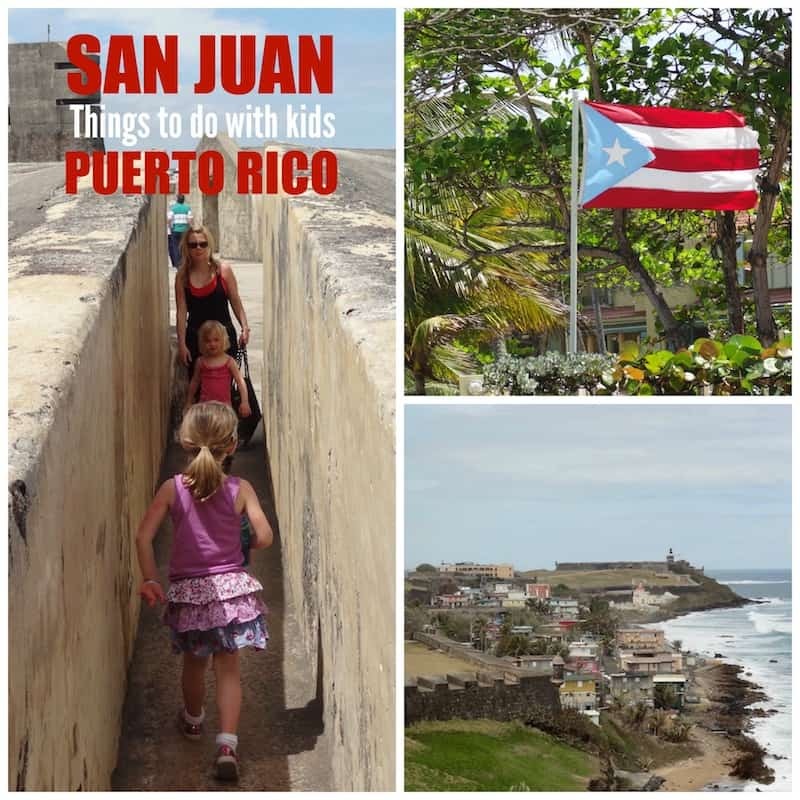 Since I typically have kids in tow this piece focuses on things to do in San Juan with kids. Albeit, if I was on my own I’d make sure to check out the food tours, night life and Bacardi tastings and tours. 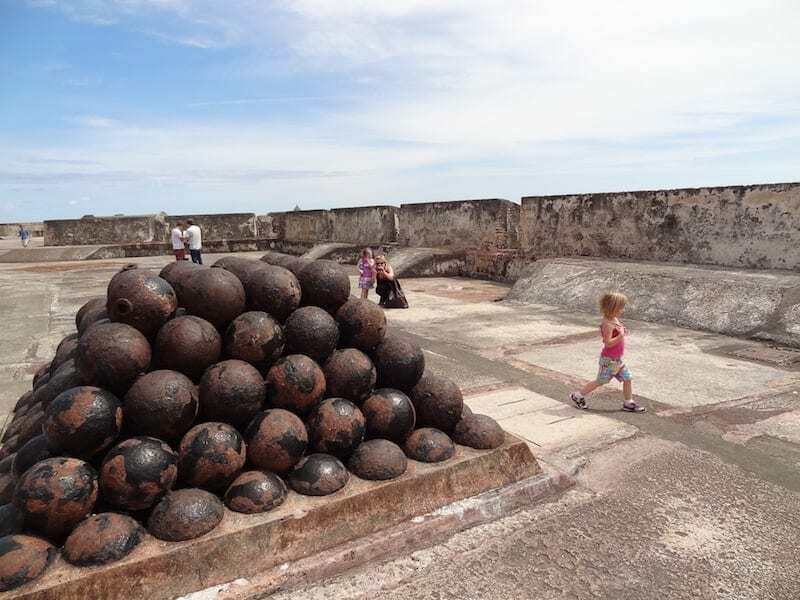 Maybe when the Princesses are older we’ll enjoy them together… In the meantime, here are the top 11 things to do in San Juan with kids. The beach was on the “must do list” everyday in San Juan for my girls. Since the weather was amazing it was an easy compromise. The mild morning temperatures were perfect for morning excursions, lunch at the beach (maybe a nap under the umbrella for little ones) followed by sandcastle making and swimming. 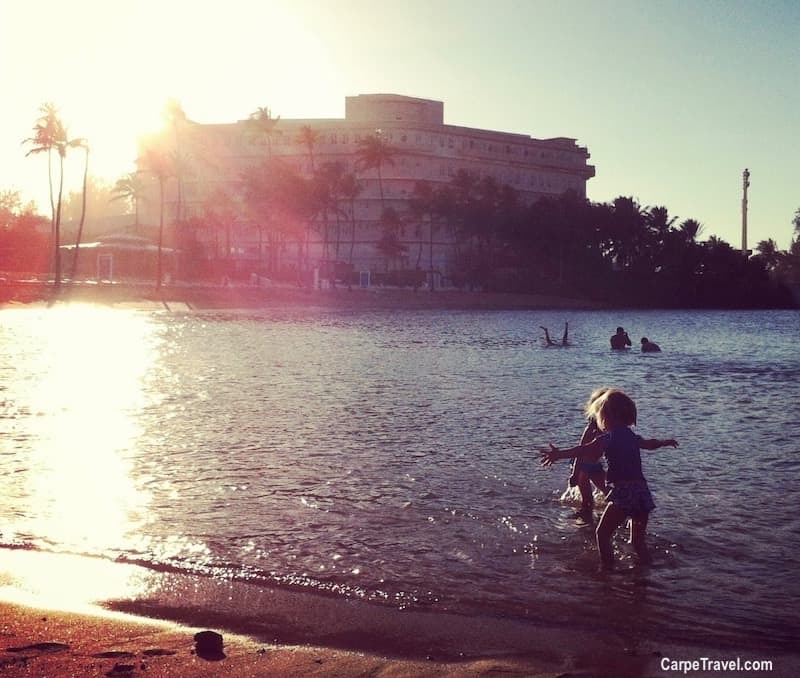 All beaches in San Juan, even those fronting the top hotels are open to the public. (Caribe Hilton is the only hotel that has a small private beach.) Beach hours are typically 9-5pm. One thing parents need to take note of, many of the beaches have a strong riptides so keep a good eye on your kids. If they’re not strong swimmers, consider putting a life jacket on them as an extra precaution. There were a few times I had to grab both my girls and we were in a “calm, swimming area”. While the beaches in San Juan are all open to the public, not all are created equal. There are only two beaches in San Juan that have life guards – El Escambron (right next to Caribe Hilton) and Isla Verde Public Beach. They both also have changing rooms, bathrooms, showers, picnic areas and onsite restaurants or snack bars. Each of these beaches are protected from reefs and rocks, providing a bit calmer water for swimming – and little ones who want to sit and splash. Isla Verde Beach is another popular beach front lined with resorts, which makes access to it a bit more difficult (Isla Verde Public Beach sits on the same stretch of land but access to it is much easier if you’re not a hotel guest). Isla Verde Beach is a great beach for families given its calm waters and the variety of amenities along the beachfront. There are a number of kiosks lining the beach where you can rent snorkeling gear or participate in a variety of water sports – snuba, parasailing, etc. This is one adventure not to be missed while in Puerto Rico! If you have younger kids though you may have to since it’s an evening activity. A visit to Bioluminescent Bay is truly a glow-in-the-dark aquatic wonder of the world. You have to see it to believe it. Bioluminescence exists around the world, but there are only a few biobays on Earth, and Puerto Rico is home to three of them. (This is a water activity so you must be prepared to ride in a kayak or small boat.) During your visit you’ll watch the dark, night waters come alive with millions of glowing plankton as you paddle your way through mangroves and forests. Want to spend a day exploring the rain forest and Bioluminescent Bay? Check out this tour and this one. Ever wanted to escape to a deserted island? This is your chance. A snorkeling cruise to the Island of Icacos is a perfect family escape – for a day. A catamaran cruise and snorkeling trip to the nature reserve, aka the Island of Icacos allows you to snorkel among the island’s fantastic marine life, explore the beaches and hunt for sea shells. Puerto Rico is home to the only rain forest in the U.S. National Forest system, making a visit to El Yunque Rain Forest National Park a must on the list of things to do with kids in San Juan. El Yunque Rain Forest is a 30-minute drive outside of San Juan. Within the park there are dozens of trails that wind past waterfalls where families can walk along and listen to the Coqui frogs and watch parrots fly overhead. One hike worth checking out is the hike to La Mina Falls. It’s about 45 minutes and you end at a natural pool where you can swim and picnic with the kids. This is popular spot for families so expect company. You may also want to try the trail outside of the visitor center, El Portal or the Angelito Trail on Rd 988 which is a short hike to the Mameyes River. To add an educational element to your visit to the rain forest, try to take of the conservation and educations tours lead by the parks rangers (times and dates vary for these tours). During these educational tours you’ll learn about the wildlife, plants and insects that call the rain forest home. It’s a great way to get a good understanding and appreciation for the rain forests ecosystem. What kid doesn’t like to go fast? Let alone imagine being Superman flying through the air? Zipline over a canopy of trees is not only exhilarating but a unique experience making it one of the more memorable things to do with kids in San Juan. Here are the top nine zipline companies in San Juan to check out. El Morro and San Cristobal were built during the 1500-1600’s to protect the island of San Juan from land-based invasions. Today they are both World Heritage Sites, and National Historic Sites that are administered by the US National Park Service. 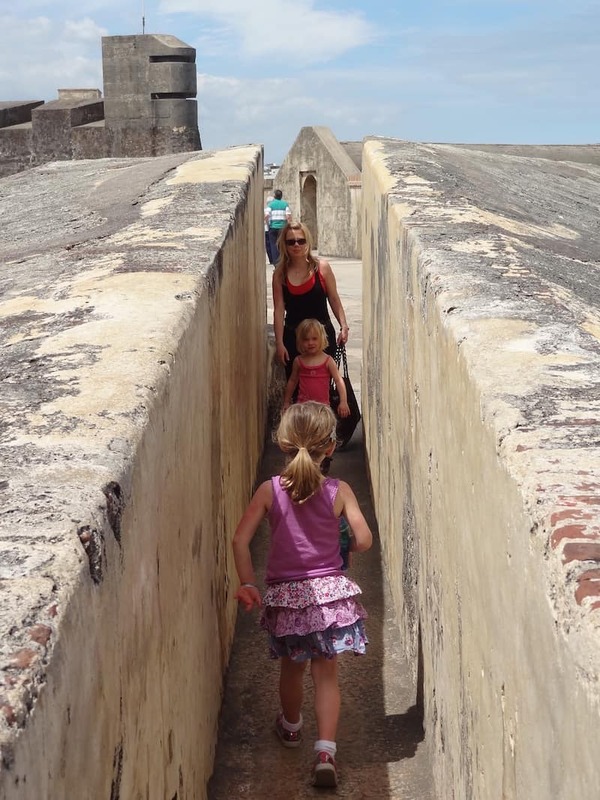 Not only do the forts provide a great history lesson but they offer kids a fun and interactive way to explore the city’s history, or just put their vivid imaginations into overdrive. Once my girls understood what the forts were and how people used them they couldn’t stop pretending they were Pirate Princesses. 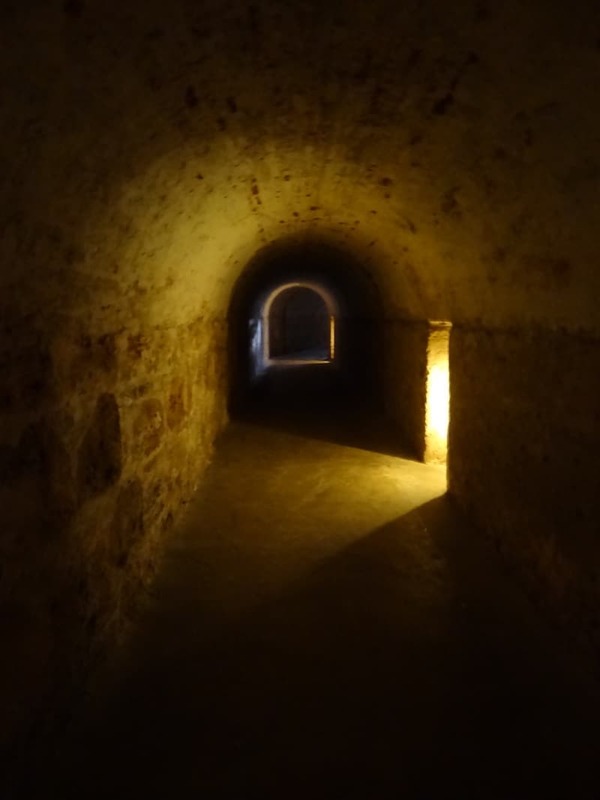 Running down the underground tunnel systems and hiding in the towers were a thrill. Walking into a “real dungeon” and seeing the drawings prisoners made on the walls made my five-year-old turn and ask me in her most serious and concerned voice, “Is this were Maleficent locked up Prince Eric”. (A Sleeping Beauty related question.) She was a bit disappointed to learn he was not in fact imprisoned in this dungeon. If you’re up for exploring both forts, do it. There is a 15-20 minute walking trail along the beach that connects them; it’s stroller friendly. If the walk is too much and you still want to do both jump on the trolley that ferries people back and forth. 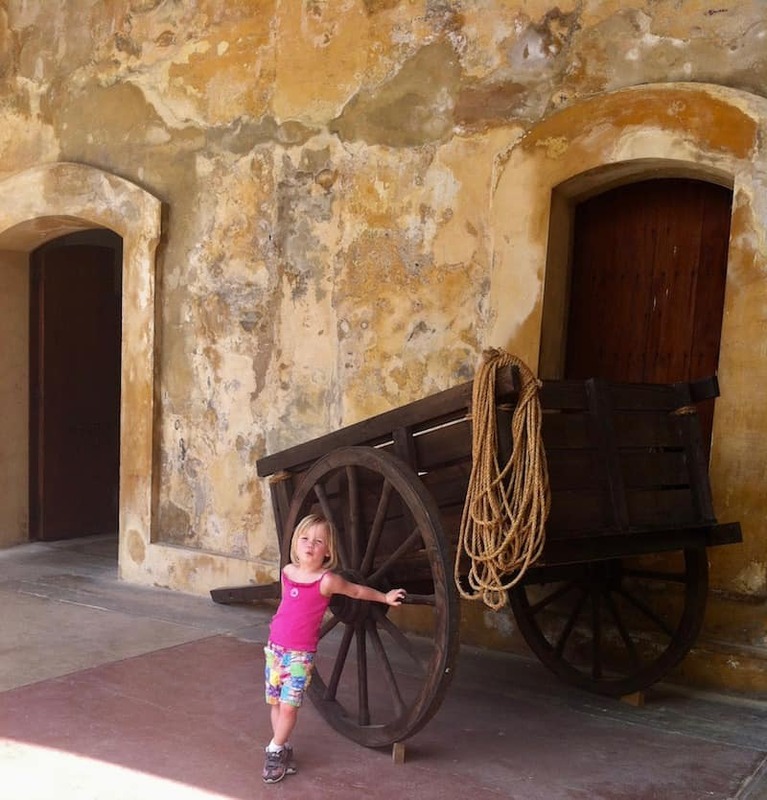 If you just have time – or the attention span – for one fort, head to El Morro. It is much larger and has a labyrinth of tunnels, towers and dungeons to explore. The grounds outside of El Morro are open and always breezy making it an ideal spot for a picnic and some kite flying. 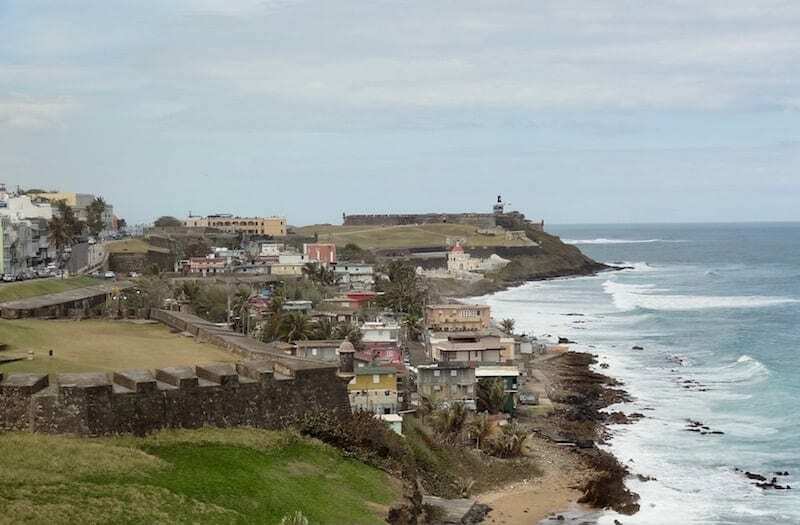 You can buy a kite in the gift shop at El Morro or San Cristobal but you may pay less at the Walgreens or Puerto Rico Drug store located across the street from El Morro. Explore the colorful buildings and charming streets of Old San Juan in a small group with the help of historian and writer David Rodriguez, author of ‘The Rise and Fall of the Great Barbate.’ During the course of the walking tour in Old San Juan, David will explain the key historic sites, Puerto Rican culture and share stories of the people who helped to define Old San Juan. The city offers free trolley tours throughout Old Town. It’s a great way to see its rich architecture while also getting a feel for where you are and what you want to do. The trolley ride is a fairly short ride around the city and you can jump on and off at each stop. I have to say, the trolley made visiting Old San Juan with kids a lot easier since it was a great place to take a little rest when my kids got tired and need to cool off. 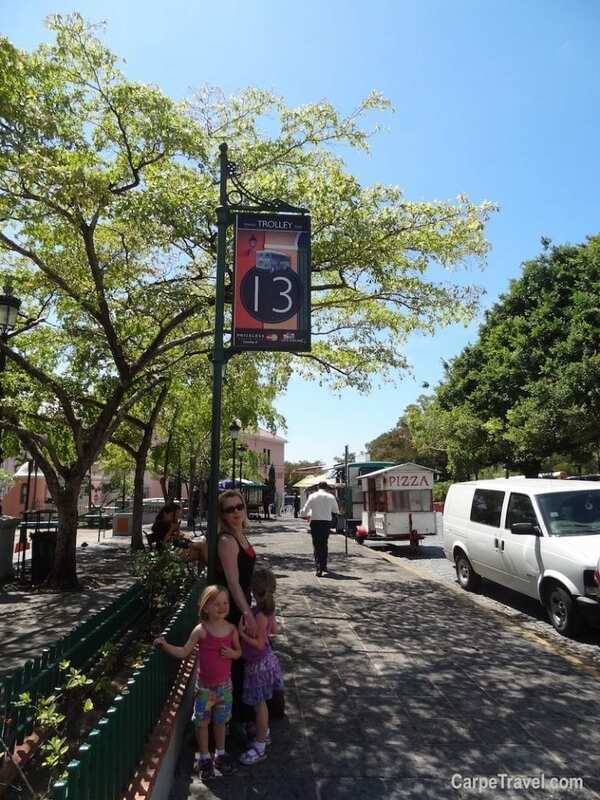 If you’re visiting Old San Juan with kids on a Sunday, head down to Paso De La Princessa. There is an outdoor market during the day (9-5pm) that’s filled with locals dancing to the live bands, vendors selling art, woodwork and everything you never knew you needed or wanted. There are countless food carts where you can grab lunch or a shaved ice (Piragua in Spanish) to cool off. During the month of February, Puerto Rico hosts its annual Carnival parades where it’s customary for people wear the traditional vejigantes, ornate masks made from either papier-mâché or coconut shells. These masks have been worn to celebrate Carnival since the first Carnival celebrations were held in Spain. The custom was brought to Puerto Rico by Spanish soldiers and have become entrenched in the islands culture. They’re great “souvenirs” to bring home, not to mention a fun shopping excursion to do with kids. Head up to Fortaleza St and San Francisco St. where kids will love looking for Carnival Masks. 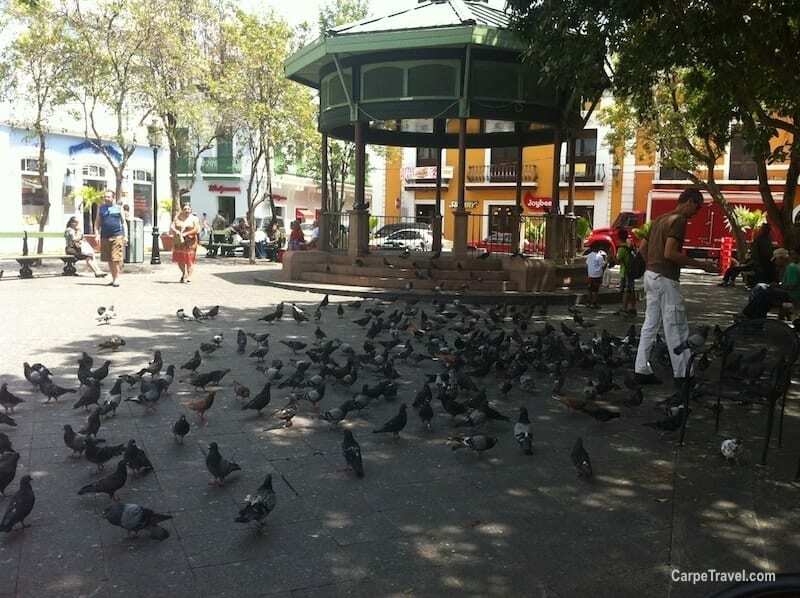 One of the best places to find authentic masks in San Juan is La Calle, located on Fortaleza St.
During our day of exploring Old San Jaun we happened upon Parque de las Palomas (Pigeon Park) during our day in Old San Juan and it immediately reminded me of the Feed the Birds scene from Mary Poppins. 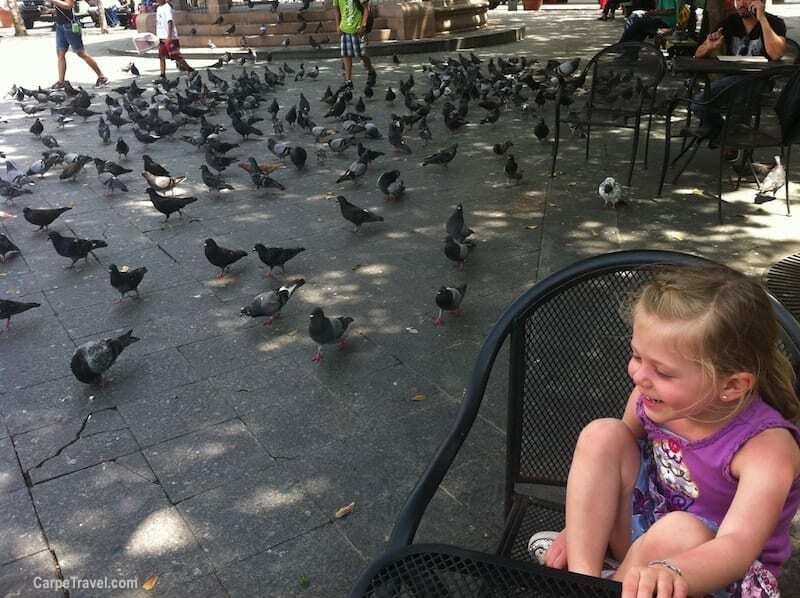 The park is covered with hundreds of pigeons all vying for the crumbs and birdseed visitors toss to them. There is usually someone there selling birdseed for visitors. There were groups of kids coming and going feeding and chasing the birds. It’s a great thing to do with kids in San Juan and one that gives you a chance to sit down to take a break. The Children’s Museum in San Juan is a great place to escape the heat or the rain. For one, it’s air-conditioned, even in the winter San Juan is hot! The museum has three floors filled with interactive exhibits and activities for kids – both little and big kids stop for kids. The information posted in the exhibits is in Spanish but there are employees there who can interpret. Better yet, download Google Translate, which will translate pictures of signs for you in real time. Your kids will have a blast, and maybe pick up a few new words. If you have a stroller and you’re walking around Old San Juan, note that the streets and sidewalks are very narrow. While you can maneuver a double stroller, it may be difficult and will require any passerby’s to step on to the road. For little ones who like to walk, again the streets are narrow and cars are not always looking out for little people. Consider a backpack carrier for little ones. The best times to visit San Juan and Puerto Rico as a whole are during the winter months. The weather is perfect and the same holidays celebrated in the United States are also celebrated on the island. The Peak season is November to April while the low season is June to September. You’ll find great travel deals during the low season but keep in mind this is also hurricane season in the Caribbean. Shoulder season is May and October where you can find great deals and typically good weather. 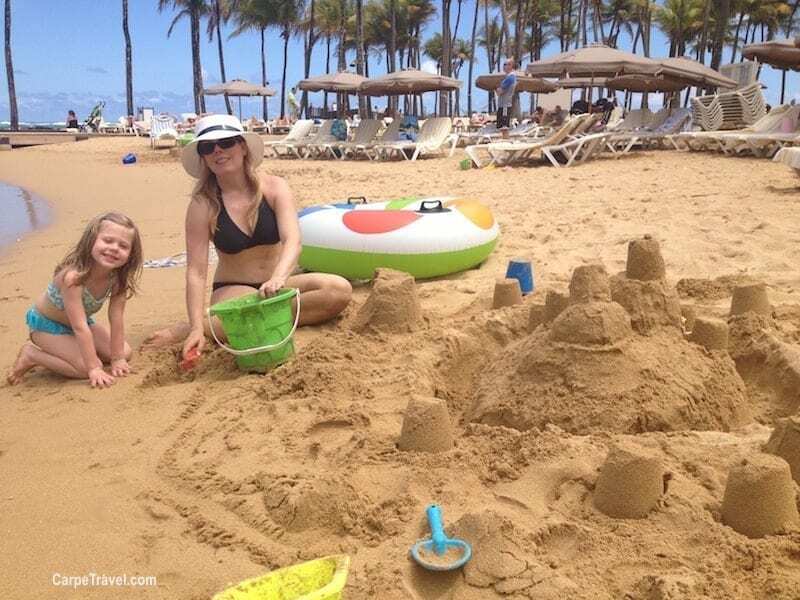 Have you gone to Puerto Rico for a family vacation? 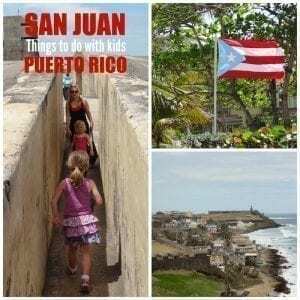 What other things to do in San Juan with kids would you recommend? Was this useful? PIN IT for later!